(AP file photo) Grand Staircase-Escalante National Monument near Boulder, Utah, as seen in 1997. Oil and gas resources played a bigger role in the controversial boundary changes ordered by President Donald Trump that removed 2 million acres from southern Utah’s two large national monuments than previously disclosed, according to Interior Department communications obtained by The New York Times. After taking Interior to court, The Times acquired 25,000 documents related to the creation and review of Bears Ears, Grand Staircase-Escalante and other national monuments. The newspaper’s goal was to shed light on the opaque process Interior Secretary Ryan Zinke used to determine what to cut out of the Utah monuments. Working under orders from Trump, Zinke launched a review last April of 26 large national monuments designated since 1996. The list was bookended by Utah’s 1.9 million-acre Grand Staircase-Escalante, designated by Bill Clinton, and the 1.35 million-acre Bears Ears, designated by Barack Obama at the request of five American Indian tribes with ancestral and cultural ties to southeastern Utah. Released to the Times were 45,000 pages of documents, 90 percent of which related to the Obama administration’s Bears Ears deliberations. About 4,500 pages concern Zinke’s multimonument review. Interior has since posted all of them. According to the Times’ documents review, Interior focused from the beginning on coal, oil and gas resources inside the two monuments. The Kaiparowits Plateau, a remote region within the heart of the former Grand Straircase boundaries, holds one of the largest coal deposits, which the Utah Geological Survey estimates contains more than 11 billion tons that are “technologically recoverable,” according to an internal memo. It also said the monument has some coal-bed methane and 550 barrels of oil held in tar sands deposits, all worth between $2 billion and $18.6 billion. Trump contracted the boundaries to exclude most of the coal reserves and retired oil and gas leases. The monument review also examined timber and forage made harder to access by the designations, but there was not much to see there. Both monuments remained covered with grazing allotments. Among the emails and memos that The Times acquired was a March 15, 2017, email Utah Sen. Orrin Hatch’s office sent to Interior, more than one month before Trump initiated the monuments review at Hatch’s request. Hatch legislative aide Edward Cox provided Interior a map showing the senior Utah senator’s proposed boundary change on the southeast side, moving the Bears Ears boundary to the eastern side of Comb Ridge, the distinctive north-south sandstone fin just west of Bluff. “The new boundary depicted on the map would resolve all known mineral conflicts for SITLA within the Bears Ears,” the email states, referring to monument inholdings administered by the Utah School and Institutional Trust Lands Administration. SITLA manages 110,00 acres scattered around the former monument, including many contiguous sections under lease for oil and gas development outside Bluff. (Francisco Kjolseth | Tribune file photo) U.S. Sen. Orrin Hatch, as seen in Utah Wednesday, Feb. 21, 2018, was a key player in urging the Interior Department to trim Bears Ears and Grand Staircase national monuments of lands rich in oil and gas, Interior Department documents reported by The New York Times show. Trump’s Bears Ears redraw almost perfectly matches the one proposed by Hatch for that corner of the monument. “While some on the Left and in the media have attempted to portray supporters of this executive order as greedy energy tycoons, the real [beneficiaries] are Utah schoolchildren and the people of San Juan County,” Hatch’s office said in a statement released Friday. The senator noted SITLA lands, deeded to Utah at statehood, are supposed to be administered to produce revenue for public education. But for a leader of Utah Diné Bikéyah, one of the tribal groups that advocated for Bears Ears, release of the emails was confirmation of hypocrisy on behalf of political leaders. “As we can see from these letters, the reassurances from Utah politicians do not match their actions,” said Willie Grayeyes, the group’s board chairman for Utah Diné Bikéyah. During and after Interior’s four-month review, Zinke repeatedly emphasized to the public that his process was not geared toward a particular outcome, but rather sought to “right-size” the vast monuments that he and others claimed exceeded the scope of the Antiquities Act. Zinke also dismissed claims that recoverable oil and gas were even present within Bears Ears’ original monument boundaries, as did Utah’s Rep. Rob Bishop, an anti-monument crusader who chairs the House Natural Resource Committee. In response to an inquiry Friday from The Salt Lake Tribune, Interior spokeswoman Heather Swift pointed out that no uranium mine or mill was located within the former Bears Ears boundaries. “The Secretary took into consideration the views of a variety of interested parties, such as Members of Congress, Governors, state and tribal leaders, and the public, including the views of those parties as to possible revised monument boundaries,” Swift wrote in an email. Another entity that communicated with Interior on the monuments, according to the Times’ documents, was Energy Fuels Inc., the Canadian-owned subsidiary that operates a uranium mine and mill just outside Bears Ears’ old borders. 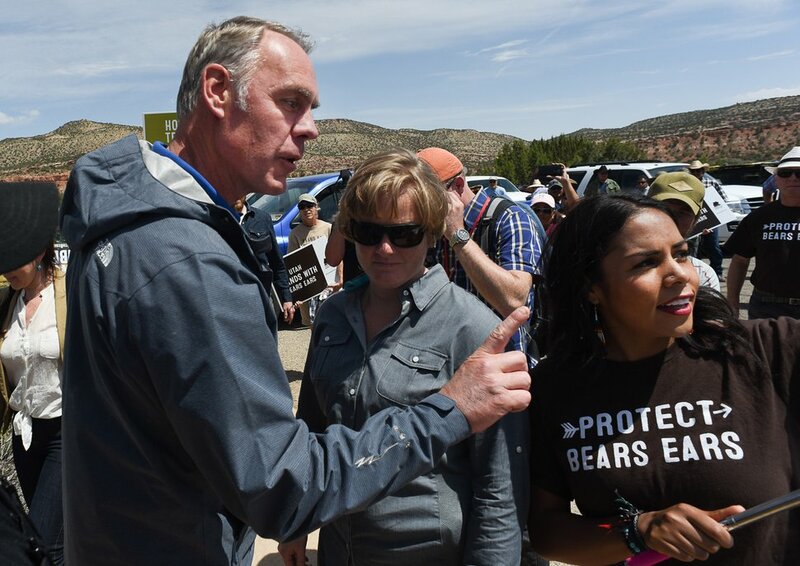 (Francisco Kjolseth | Tribune file photo) Interior Secretary Ryan Zinke snaps at pro-monument activist Cassandra Begay in November during his tour of Bears Ears National Monument in southeastern Utah. Documents reported by The New York Times reveal that oil and gas reserves played a big role in the Interior Department review of how to trim Bears Ears and Grand Staircase national monuments. On July 17, two top Zinke aides met with Energy Fuels executive Paul Goranson and lobbyist Andrew Wheeler to hear their concerns about how the Bears Ears monument could impede their operations just outside the boundary. According to a May 25 letter previously obtained by The Washington Post, Energy Fuels implored Interior to trim Bears Ears in ways that protect its assets on the monument’s periphery, which included the nation’s last operating uranium mill. “Reducing our reliance on foreign sources of uranium requires a facility that can process the abundant uranium resources that are located in the region near the White Mesa mill,” wrote chief operating officer Mark Chalmers. The company feared having a national monument abutting the mill, which features a network of wastewater ponds, would affect its operations, putting at risk the nation’s ore-processing capacity. Obama’s designation of Bears Ears deliberately excluded uranium deposits that were being actively explored, mainly around Red Canyon and Black Mesa. But his proclamation did include many lands with high uranium potential that were also encumbered by mining claims. “There are also many other known uranium and vanadium deposits located within the [monument’s original boundaries] that could provide valuable energy and mineral resources in the future,” Chalmers wrote in the May 25 letter. At Zinke’s recommendation, Trump stripped nearly all the promising uranium deposits and claims from the monument, including those on Cedar Mesa, the area that holds the nation’s densest concentrations of archaeological sites, according to an analysis by the environmental group Southern Utah Wilderness Alliance. In an interview Monday, Energy Fuels spokesman Curtis Moore emphasized that his company does not hold mining claims inside the old monument boundary and has no intention of operating there. He acknowledged the company had sought minor boundary reductions near its idled Daneros mine and White Mesa mill, but nothing approaching the 85 percent reduction Trump ultimately ordered. Last week, the BLM authorized a major expansion of Daneros, enabling it to extract 500,000 tons of ore, which would be trucked over Cedar Mesa to the White Mesa mill.